The index opened positive and stayed strong for the entire session of trade to close in the green after 5 days at 7735.50, gain of 28.95 points. The broader market though was weak with 737 advances to 804 declines. Range for the series now at 7500-8100. 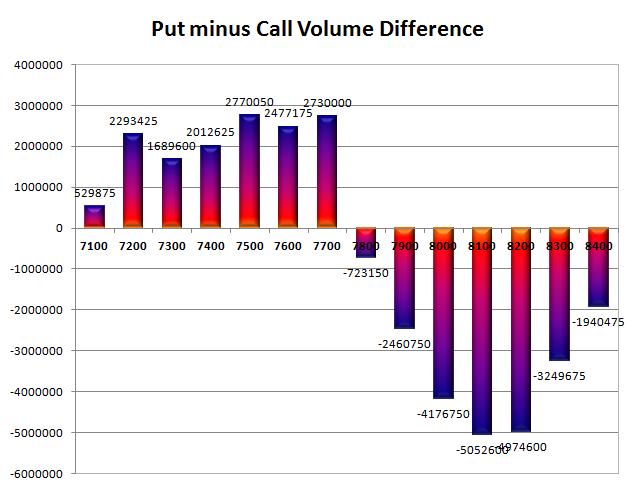 Call option 7800-7900, 8100 added 10.02 lacs OI with small profit booking seen at 8000 and 8200 strike prices. Put option 7700-7100 added 12.34 lacs OI with short covering seen at 7800 and above strike prices. 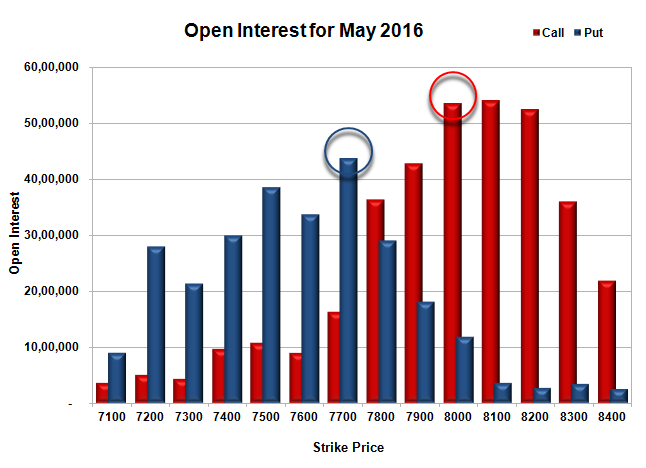 Nifty Open Interest is at 1,82,52,900 down by 9,39,000, with increase in price, most probably huge short covering. 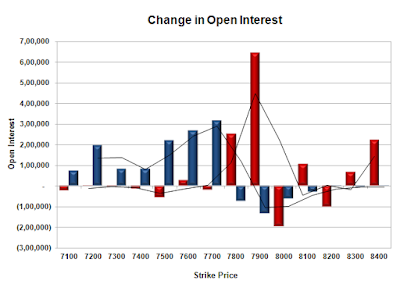 Bank Nifty Open Interest is at 16,63,500 down by 84,570, with increase in price, most probably short covering. FII’s sold 16795 contracts of Index Futures, which includes net 16459 contracts long liquidation and 336 contracts short build-up, with decrease in net OI by 16123 contracts, includes 24407 longs to 41202 shorts for the day. FII’s Index future open contract as on date is 152340 Longs to 88752 Shorts, Net 63588 down by 16795 contracts. Initial and best support still at 7700, with OI of 43.73 lacs and below that at 7600 with OI of 33.72 lacs. Initial resistance at 7800, with OI of 36.37 lacs and above that at 7900 with OI of 42.81 lacs. 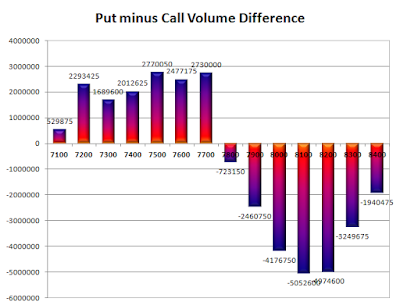 Day Range as per Option Table is 7672 - 7807 and as per VIX is 7666 - 7805 with 7740 as the Pivot.